This Nativity set is handcrafted entirely from wool felt in Kyrgyzstan, a Central Asia nation along the famous Silk Road route. This set is heavily embroidered. Mary, Joseph and baby Jesus in his manger are joined by two horses, a sheep, and a camel. 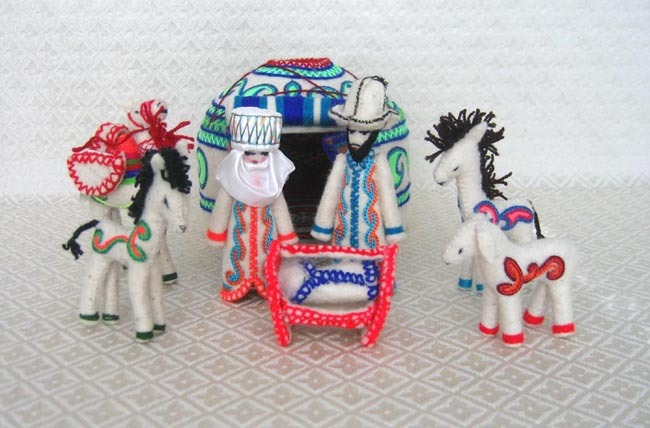 The figures come inside a colorfully embroidered yurt—the traditional felt dwelling of Central Asian nomadic peoples. The Joseph figure measures 5 inches tall while the yurt measures 6.25 inches in diameter.